One for the road. And another one. 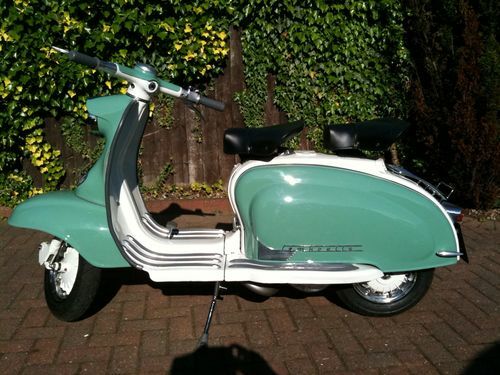 Browsing eBay, as I do, just on the off chance my lottery numbers come up, I came across a couple of rather nice Series 1’s… each with a completely different look and feel. 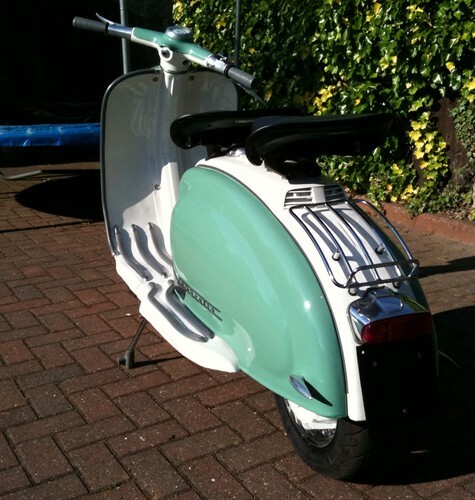 First up is this restored example in turquoise and white… 175 AF Rayspeed kit and a Clubman exhaust… it’s got a fixed “Buy it now” price of £3,150. Very tidy, very nice. 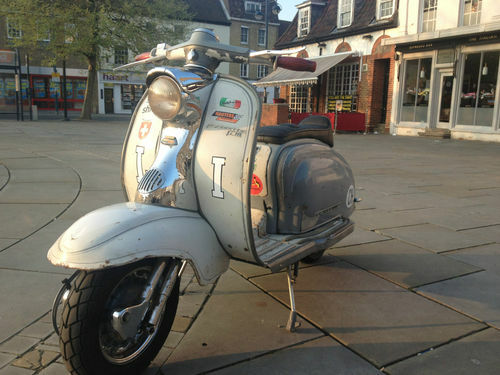 If it’s your cup of tea, here’s the link: Lambretta Series One on eBay. 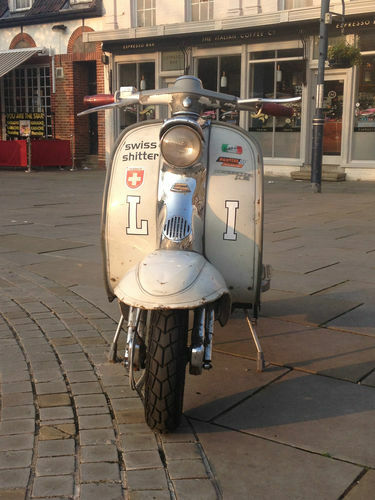 But I think I actually prefer this one… “The Swiss Shitter” Based on a Swiss model* Series One, and also dating from ’59… this ‘rat look racer’ has a lovely patina about her… love the “stickerbomb” look and the chrome horncast. 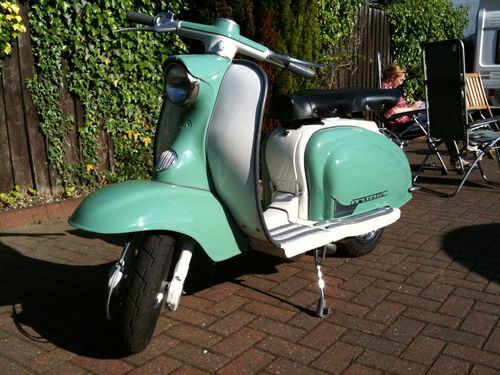 It’s got a Rapido 225 lump, GP 200 Gearbox and the carb and exhaust (a Fresco) to go with it. 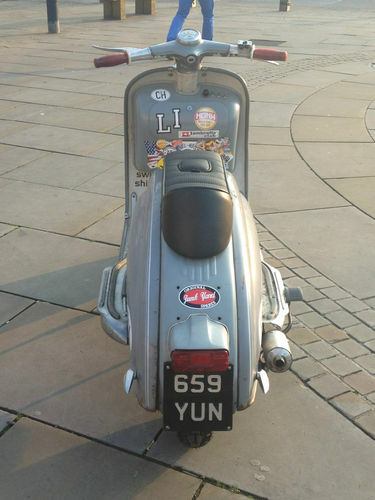 Currently sitting at £2,250 but with four days to go, and this one will go higher. Here’s the link. *Swiss model? No, I didn’t know they made one either. I can feel a bit of research and a blog post coming on! 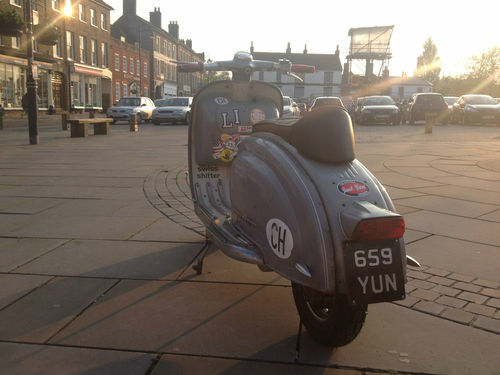 From the eBay listing, there was hand pinstriping as standard, as well as side panel and front mudguard embellishers, and running board protectors. 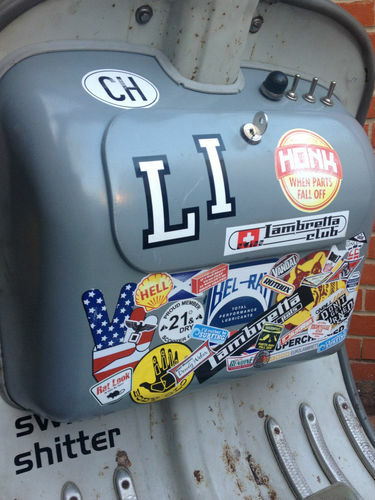 This entry was posted in For Sale, Restoration, Scooters and tagged Auction, eBay, Lambretta, patina, racer, rat, rat bike, rat look, Series 1, stickerbomb, Swiss Model, Switzerland by crocodilejock. Bookmark the permalink.